VOTE 116. 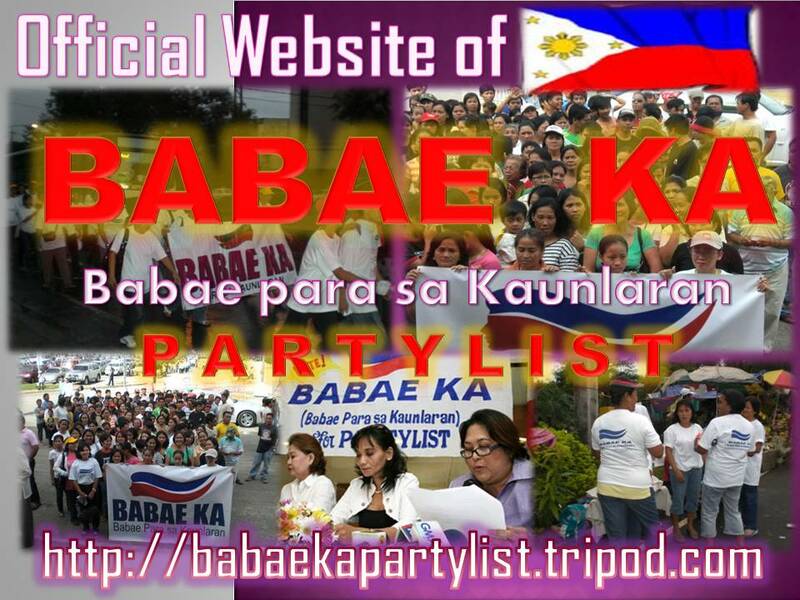 BABAE KA PARTYLIST: THE FIVE POINT PROGRAM OF BABAE KA known as "HELPS"
and the Filipinos, as a whole. and not a leftist or rightist coalition. AN ACT PROVIDING FOR THE ELECTION OF PARTY-LIST REPRESENTATIVES THROUGH THE PARTY-LIST SYSTEM, AND APPROPRIATING FUNDS THEREFOR. Section 1. Title. - This Act shall be known as the "Party-List System Act". Sec. 2. Declaration of Policy. - The State shall promote proportional representation in the election of representatives to the House of Representatives through a party-list system of registered national, regional and sectoral parties or organizations or coalitions thereof, which will enable Filipino citizens belonging to the marginalized and underrepresented sectors, organizations and parties, and who lack well-defined political constituencies but who could contribute to the formulation and enactment of appropriate legislation that will benefit the nation as a whole, to become members of the House of Representatives. Towards this end, the State shall develop and guarantee a full, free and open party system in order to attain the broadest possible representation of party, sectoral or group interests in the House of Representatives by enhancing their chances to compete for and win seats in the legislature, and shall provide the simplest scheme possible. Sec. 3. Definition of Terms. - (a) The party-list system is a mechanism of proportional representation in the election of representatives to the House of Representatives from national, regional and sectoral parties or organizations or coalitions thereof registered with the Commission on Elections (COMELEC). Component parties or organizations of a coalition may participate independently provided the coalition of which they form part does not participate in the party-list system. Sec. 4. Manifestation to Participate in the Party-List System. - Any party, organization, or coalition already registered with the Commission need not register anew. However, such party, organization or coalition shall file with the Commission, not later than ninety (90) days before the election, a manifestation of its desire to participate in the party-list system. Sec. 5. Registration. - Any organized group of persons may register as a party, organization or coalition for purposes of the party-list system by filing with the COMELEC not later than ninety (90) days before the election a petition verified by its president or secretary stating its desire to participate in the party-list system as a national, regional or sectoral party or organization or a coalition of such parties or organizations, attaching thereto its constitution, by-laws, platform or program of government, list of officers, coalition agreement and other relevant information as the COMELEC may require: provided, that the sectors shall include labor, peasant, fisherfolk, urban poor, indigenous cultural communities, elderly, handicapped, women, youth, veterans, overseas workers, and professionals. Sec. 7. Certified List of Registered Parties. - The COMELEC shall, not later than sixty (60) days before election, prepare a certified list of national, regional, or sectoral parties, organizations or coalitions which have applied or who have manifested their desire to participate under the party-list system and distribute copies thereof to all precincts for posting in the polling places on election day. The names of the party-list nominees shall not be shown on the certified list. Sec. 8. Nominations of Party-List Representatives. - Each registered party, organization or coalition shall submit to the COMELEC not later than forty-four (45) [sic] days before the election a list of names, not less than five (5) from which party-list representatives shall be chosen in case it obtains the required number of votes. Sec. 9. Qualification of Party-List Nominees. - No person shall be nominated as party-list representative unless he is a natural born citizen of the Philippines, a registered voter, a resident of the Philippines for a period of not less than one (1) year immediately preceding the day of the election, able to read and write, bona fide member of the party or organization which he seeks to represent for at least ninety (90) days preceding the day of the election, and is at least twenty-five (25) years of age on the day of the election. In case of a nominee of the youth sector, he must at least be twenty-five (25) but not more than thirty (30) years of age on the day of the election. Any youth sectoral representative who attains the age of thirty during his term shall be allowed to continue until the expiration of his term. Sec. 10. Manner of Voting. - Every voter shall be entitled to two (2) votes. The first is a vote for candidate for member of the House of Representatives in his legislative district, and the second, a vote for the party, organization, or coalition he wants represented in the House of Representatives: provided, that a vote cast for a party, sectoral organization, or coalition not entitled to be voted for shall not be counted: provided, finally that the first election under the party-list system shall be held in May 1998. The COMELEC shall undertake the necessary information campaign for purposes of educating the electorate on the matter of the party-list system. Sec. 11. Number of Party-List Representatives. - The party-list representatives shall constitute twenty percentum (20%) of the total number of the members of the House of Representatives including those under the party-list. For purposes of the May 1998 elections, the first five (5) major political parties on the basis of party representation in the House of Representatives at the start of the Tenth Congress of the Philippines shall not be entitled to participate in the party-list system. The parties, organizations, and coalitions shall be ranked from the highest to the lowest based on the number of votes garnered during the elections. The parties, organizations, and coalitions receiving at least two percent (2%) of the total votes cast for the party-list system shall be entitled to one seat each: provided, that those garnering more than two percent (2%) of the votes shall be entitled to additional seats in proportion to their total number of votes: provided, finally, that each party, organization, or coalition shall be entitled to not more than three (3) seats. Sec. 12. Procedure in Allocating Seats for Party-List Representatives. - The COMELEC shall tally all the votes for the parties, organizations, or coalitions on a nationwide basis, rank them according to the number of votes received and allocate party-list representatives proportionately according to the percentage of votes obtained by each party, organization, or coalition as against the total nationwide votes cast for the party-list system. Sec. 13. How Party-List Representatives are Chosen. - Party-list representatives shall be proclaimed by the COMELEC based on the list of names submitted by the respective parties, organizations, or coalitions to the COMELEC according to their ranking in the said list. Sec. 14. Term of Office. - Party-list representatives shall be elected for a term of three (3) years which shall begin, unless otherwise provided by law, at noon on the thirtieth day of June next following their election. No party-list representatives shall serve for more than three (3) consecutive terms. Voluntary renunciation of the office for any length of time shall not be considered as an interruption in the continuity of his service for the full term for which he was elected. Sec. 15. Change of Affiliation Effect. - Any elected party-list representative who changes his political party or sectoral affiliation during his term of office shall forfeit his seat: provided, that if he changes his political party or sectoral affiliation within six (6) months before an election, he shall not be eligible for nomination as party-list representative under his new party or organization. Sec. 16. Vacancy. - In case of vacancy in seats reserved for party-list representatives, the vacancy shall be automatically filled by the next representative from the list of nominees in the order submitted to the COMELEC by the same party, organization, or coalition, who shall serve for the unexpired term. If the list is exhausted, the party, organization, or coalition concerned shall submit additional nominees. Sec. 17. Rights of Party-List Representatives. - Party-list representatives shall be entitled to the same salaries and emoluments as regular members of the House of Representatives. Sec. 18. Rules and Regulations. - The COMELEC shall promulgate the necessary rules and regulations as may be necessary to carry out the purpose of this Act. Sec. 19. Appropriations. - The amount necessary for the implementation of this Act shall be provided in the regular appropriations for the Commission on Elections starting fiscal year 1996 under the General Appropriations Act. Starting 1995, the COMELEC is hereby authorized to utilize savings and other available funds for purposes of its information campaign on the party-list system. Sec. 20. Separability Clause. - If any part of this Act is held invalid or unconstitutional, the other parts or provisions thereof shall remain valid and effective. Sec. 21. Repealing Clause. - All laws, decrees, executive orders, rules and regulations, or parts thereof, inconsistent with the provisions of this Act are hereby repealed. Sec. 22. Effectivity. - This Act shall take effect fifteen (15) days after its publication in a newspaper of general circulation. (Sgd.) EDGARDO J. ANGARA (Sgd.) JOSE DE VENECIA, JR. This Act, which is a consolidation of House Bill No. 3043 and Senate Bill No. 1913, was finally passed by the House of Representatives and the Senate on February 28, 1995.